Today's topic at Armchair BEA is nonfiction. Ten years ago, I probably would have just said that I rarely read nonfiction (because I did), but joining book groups changed all that. Through the varied selections of my multiple book groups, I discovered that nonfiction does not equal boring, dry facts. I also discovered that I absolutely love memoirs. The Anatomy of Hope by Jerome Groopman - I read this book about a year into my chronic illness, at the depth of misery and mourning, and it truly restored my hope. River of Doubt by Candice Millard, about Teddy Roosevelt's journey up the Amazon. The Immortal Life of Henrietta Lacks by Rebecca Skloot - gripping, fascinating, and thought-provoking. The Big Burn: Teddy Roosevelt and the Fire That Saved America by Tim Egan, about the formation of the national parks. And some of my favorite memoirs - do I have to choose? I love them all! 12,000 Miles in the Nick of Time: A Semi-Dysfunctional Family Circumnavigates the Globe by Mark Jacobson - travel AND family in one memoir - what more could I want? Waiting for Snow in Havana: Confessions of a Cuban Boy by Carlos Eire - a fascinating historical backdrop told from a child's perspective and one of the summer reading selections at my son's high school this year! The House at Sugar Beach: In Search of a Lost African Childhood by Helene Cooper - a chilling, compelling story about growing up in Liberia. The Diving Bell and the Butterfly by Jean Dominique-Bauby - inspirational and emotionally powerful story of a paralyzed man. The Life and Times of the Thunderbolt Kid by Bill Bryson - we love all of Bryson's memoirs, but this one about his childhood is especially good...and hilarious! The Invisible Wall by Harry Bernstein - fascinating historical memoir about growing up in England in the 1910's on a street inhabited by Jews on one side and Christians on the other. Can't wait to read the sequel. See? I told you I couldn't pick. I could go on and on. What are your favorite nonfiction books and memoirs? Today's topic for Armchair BEA is genre fiction. My book tastes and reading habits have changed dramatically in this regard over the past 30 years. When I was younger, I read ONLY genre fiction - mostly suspense, thrillers, horror, and some mysteries. In high school, I got hooked on Stephen King and read everything he wrote, along with my mom and dad. The latest Stephen King novel would be released, and we'd pass it from one of us to the next. I got married at 24, and my husband liked all these same types of novels, so we carried on my family tradition of trading books. He also re-introduced me to science fiction. In high school, I'd read every single Ray Bradbury book on the shelves at my public library but had forgotten how much I enjoyed some of that genre. My husband introduced me to The Hobbit and Ender's Game (and the rest of Orson Scott Card's series). Fast-forward to about 10 years ago, when I joined my first book group. Suddenly, my reading horizons were broadened! That first group dissolved after a few years, but then I discovered my neighborhood book group and another book group hosted by the local Unitarian church. I still belong to both of those, plus try to go to the monthly book discussion at my public library when I can fit it in and just recently started an online family book group! All these book groups did amazing things for my reading habits. I read historical fiction for the first time ever and loved it. I read nonfiction for the first time ever and also discovered that I loved reading memoirs. I now read a very wide variety of books, still mostly fiction. These days, the genre doesn't matter so much as the quality of the writing. As I was thinking about today's topic, I first thought that I no longer read genre fiction, but I do read some thrillers/suspense/mystery and some science fiction...but only if it is really good (which I judge mainly by what reviewers, fellow bloggers, and friends recommend). Night Strangers by Chris Bohjalian - perfect for Halloween last year! Before I Go To Sleep by S.J. Watson, a creepy and very suspenseful novel. Blind Descent by Nevada Barr - though I don't read many classic mysteries anymore, I love Barr's Anna Pigeon series because they take place in National Parks. Plum Spooky by Janet Evanovich - her Stephanie Plum novels are my guilty pleasures! Time and Again by Jack Finney - a classic time travel novel that is more historical fiction than science fiction. Ready Player One by Ernest Cline - one of my favorite books from last year that I passed onto my husband and son - we all loved it! Breathless by Dean Koontz - I used to read all of Koontz's horror novels, but my husband told me I'd love this unique sci fi, and I did - it fills you with a sense of wonder. The Passage by Justin Cronin - reminded me of my old love for Stephen King - fabulous suspense, horror, and science fiction all rolled into one - I can't wait to read the sequel this summer. Replay by Ken Grimwood - my favorite book of all time. While often categorized as science fiction because it's about a man who keeps replaying a portion of his life, it's just about life and how the decisions we make affect our lives - fascinating and thought-provoking. Huh. So, I guess I do read genre fiction after all! The Book Expo of America (BEA) kicks off today in NYC. It is the ultimate conference for book lovers. Even more enticing, they now offer an entire program at BEA just for Book Bloggers. I would love to be there in person to meet my fellow bloggers, listen to favorite authors, and talk books non-stop for days. Since I can't do that, I thought that this year I would try participating in Armchair BEA, where book bloggers can network in the virtual world while our lucky colleagues get to network in person. I am 47 years old, married to another book lover, and mother of two sons, ages 18 and 15 (one who is another rabid book fan and the other who is not). I have always been a book lover, from my earliest days flipping pages of Go, Dog, Go! while sitting on my potty seat (seriously, we have photos) to the present where I write two book blogs and belong to four book groups. I began this book blog over seven years ago in 2006 and within a couple of weeks added a second one, Great Books for Kids and Teens. Outside of blogging, I am also a freelance writer; my reviews of books and other media for kids have been published for the past 8 years in Family Fun magazine. I also write about food, health, travel, and family topics. We currently live in Delaware, the second-smallest state in the U.S. We moved here about 20 years ago when my husband and I were transferred (we both used to work for DuPont; now only he does). I am originally from Rochester, NY, and my husband is from Oklahoma. We met when we were both living and working in New Orleans, and that city holds a special place in our hearts. I have a chronic illness, an immune system disorder known in the U.S. by the silly term Chronic Fatigue Syndrome (CFS), though it is a very debilitating illness. I write another blog about living with chronic illness, Learning to Live with CFS, that has a very positive focus (writing this post, I am beginning to see why I never have enough time for everything I want to do...). Check it out if you or someone you care about has a chronic illness...or just stop by on Mondays for my movie reviews! This is my first time participating in Armchair BEA, though I have wanted to do it in past years and just didn't have time - we'll see if I can make the time this week! I would love to visit BEA in person and only live 2 hours from NYC, but right now, that would be a bit too much for my limited stamina. Armchair BEA is perfect for me - I like things I can do from the comfort of my couch. Welcome to My Reading World, my first blog post, from 2006, that tells you about my relationship with books and how it's changed over the years. Top Ten Favorite Novels, my first Top Ten post, before I even knew what a meme was! I like looking back at old Top Ten posts because sometimes we forget our older favorite books and only remember the more recent ones. Meeting with Author Rachel Simon, for 3 reasons: I love my book group, I love The Story of Beautiful Girl, and I loved meeting one of my favorite authors. 2013 Big Book Summer Challenge - I started my first-ever challenge last summer and had so much fun I am doing it again this summer. Although you only need to read 1 book over 400 pages this summer to participate, I have several big books I've been saving up for the challenge. Join the fun! So, that's me - now I need to visit some other Armchair BEA posts and meet YOU. It's Monday 5/27! What Are You Reading? Happy Memorial Day to those of you in the U.S.! 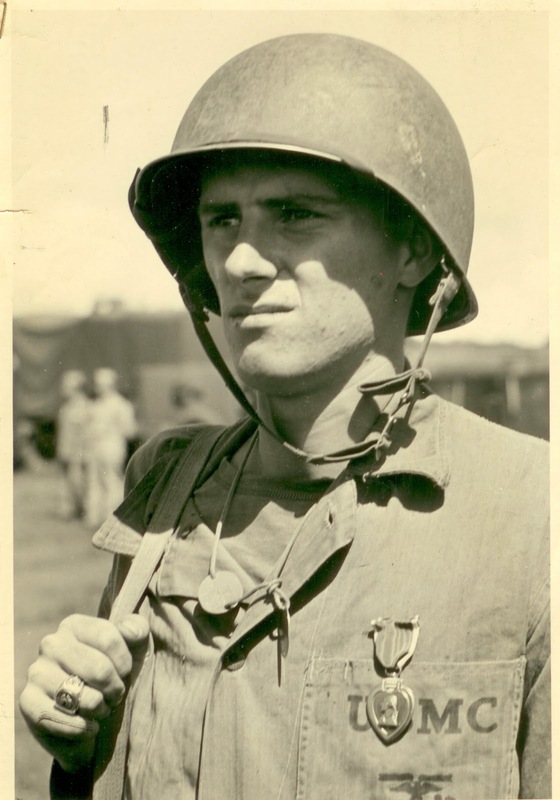 My grandfather was a proud Marine who served in World War II and was at Iwo Jima, so he is on my mind today. He died a few years ago. My big news today is the kick-off of my annual Big Book Summer Challenge! I love using the long days of summer (and the break from my book groups) to tackle some of the bigger books I never seem to have time for. You only need to read a minimum of 1 book over 400 pages long between now and September to participate, so check it out and join in the fun! I hope you've all enjoyed the Memorial Day weekend - we've had a very leisurely weekend. Our younger son has been visiting his grandparents, helping them get their sailboat ready for the season, and our older son is home from college but has been out with friends much of the time, so Ken and I have enjoyed lots of quiet time together, a nice dinner out with friends last night...and lots of reading! I finally finished American Pastoral by Philip Roth. It is a long novel with very dense prose, but I found it very thought-provoking and interesting and am glad I read it. Reviews from my book group were widely varied - some really disliked it; others loved it. I will post a review this week. I am also still reading (a bit at a time) The Art of Nonconformity: Set Your Own Rules, Live the Life You Want, and Change the World by Chris Guillebeau, which was recommended by a friend of mine. 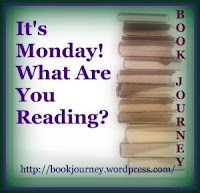 I have just started The Book Thief by Markus Zusak (my second time) for my online family book group this week. It is just as good as I remembered...and also counts as my first Big Book of the summer! In some spare minutes, I read a middle-grade graphic novel, Tommysaurus Rex by Doug Tennepel. It is a fun, imaginative story sure to appeal especially to middle-grade boys. And, finally, I am listening to The Boy in the Striped Pajamas by John Boyne on audio. It is just as good as I'd heard from everyone. My husband, Ken, is still reading A Storm of Swords by George R.R. Martin, book 3 in his A Song of Ice and Fire series. At over 1200 pages, this novel definitely meets the criteria of a Big Book! He is almost finished with it now. Jamie, 18, is thrilled to be done with his first year of college and taking full advantage of finally having some reading time! He finished The Lost Hero by Rick Riordan, Book 1 in the Heroes of Olympus series, moved onto Book 2, The Son of Neptune, and is now reading Book 3, The Mark of Athena. A new friend from college loves reading as much as Jamie does, so they are both reading this series right now. He told me he is planning to start a book club with his friends in the fall - I'm so proud! Craig, 15, is very busy trying to finish up all his work for the school year, including some make-up work still left from his last surgery in February. He is reading Romeo and Juliet for his Freshman Lit class this week. The Orphan Master's Son by Adam Johnson, an amazing novel that just won the 2013 Pulitzer Prize for fiction - highly recommended. And I launched my Big Book Summer Challenge this weekend. Like summer itself, it is a low-key, easy-going challenge, so check it out. I also posted my own list of books to read for the challenge. 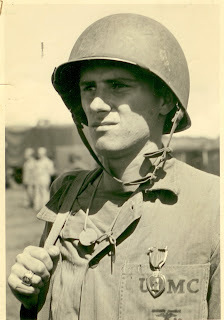 Thinking of my Grandpa today who served as a Marine in World War II. My 2013 Big Book Summer! 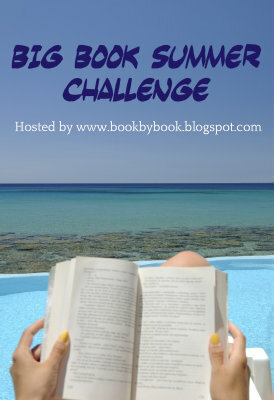 I have just announced the second year of my challenge, Big Book Summer Challenge, so I guess I should be the first to sign up! The first two are YA novels - I like to alternate between grown-up books and kids/teen books. I've actually read The Book Thief before, but my online family book group is discussing it soon, so I thought I'd re-read it. The rest are all books I've been meaning to read for a while. It was so hard to choose! I have many more big books on my shelves, but I also have 3 more book group reads coming up in June before my book groups take a break for the summer. We'll see how many of these I get to! It was so much fun that last year, I created this challenge so that YOU can join me! And here it is Memorial Day weekend again and the official start of summer 2013. So join in on the fun! The challenge will run from Memorial Day weekend (last weekend in May) through Labor Day weekend (first weekend in September). You can write progress posts if you want to and/or reviews of the big books you've read...but you don't have to! There is a separate links list for big book review posts. 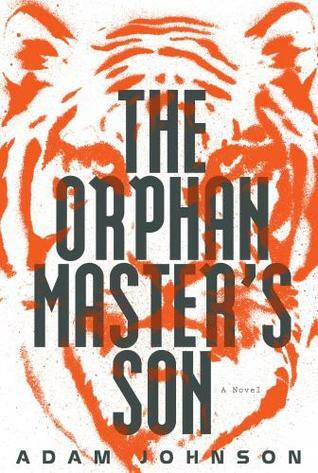 The 2013 Pulitzer Prize for Fiction was recently awarded to The Orphan Master’s Son by Adam Johnson. Normally, I wouldn’t run right out to read the latest winner, but this one was familiar to me. Ann and Michael, the hosts of my favorite book podcast, Books on the Nightstand, had loved this novel, and I remembered hearing them both praise it in a podcast earlier this year. So, I requested it from the library and must have been ahead of the crowd because there was no wait list. I am so glad that I read it right away because this novel blew me away. First a word of warning: if all I’d heard of this book was a plot summary, I probably never would have read it. In fact, I was only a few pages into the novel and had learned that it was about a young boy in North Korea who is forced to join the army, and I wondered whether I was going to like it or if this would be one of those literary novels that are just plain boring. I needn’t have worried. Adam Johnson has created a fascinating world and an intriguing main character, and his writing just pulls the reader into the middle of the story. I never wanted it to end. So, I’ll tell you about the plot, but there is so much more to this story than meets the eye. Pak Jun Do has been brought up in an orphanage (aka children’s labor camp) in North Korea by his father who runs the orphanage. He spends his whole life explaining to people that no, he is not an orphan, but no one believes him because he has an orphan’s name and grew up in an orphanage. His mother, a singer, was taken away – as are most beautiful women in North Korea – to the capital city of Pyongyang when he was very young, and his father was physically present but emotionally absent, wracked with despair over his wife’s absence. At fourteen, Pak Jun Do and the orphans are conscripted into the army to save them all from starvation during a terrible famine in North Korea. From there, his life continues through many different stages, from a tunnel fighter as a teen to a kidnapper to eventually, through an amazing twist of fate, working alongside Kim Jong Il, the Dear Leader himself. The details of Pak Jun Do’s various horrible jobs and of daily life in North Korea are both captivating and terrible. The entire novel is absolutely gripping. It probably sounds depressing from this plot description – and parts of it are sad – but its overall tone is optimistic because Pak Jun Do is a wonderful man who never loses hope of a better life. In fact, at one point, his wildest dreams come true. Certainly parts of his story are horrifying and violent, but one part of the novel – when a group of North Koreans visit Texas – had me laughing out loud. This is an emotionally moving story, and you soon find yourself rooting for Pak Jun Do and hoping he can somehow escape to a better life. I was even talking out loud to the book (always a good sign! ), alternating “Nooo!” with “Oh, good.” The ending is both happy and sad at the same time. Johnson is a masterful writer who pulls the reader into the center of the story and never lets go, until the final word. I couldn’t wait to find out what happened to Pak Jun Do and also never wanted his story to end. A novel this good is a rare find. Listen to a funny, fascinating presentation by Johnson at Booktopia Santa Cruz. Here is a list of all of the Pulitzer Prize Winners for Fiction since 1948 - I've read 9 of the 59 novels - I better get busy! It's Monday 5/20! What Are You Reading? Ahhh...the quiet solitude of a Monday morning after a busy weekend. But this is the end of the peace and tranquility for me for a while! My oldest son comes home from college this week, my youngest son has two weeks of school left, then finals, and then another knee surgery. So, I am trying to make the most of this last bit of quiet, productive time! I finished The Orphan Master's Son by Adam Johnson and was blown away by this recent Pulitzer Prize winner! The story completely pulled me in, and I never wanted it to end. I'll try to review it this week (before things get hectic!). I am now reading American Pastoral by Philip Roth for my neighborhood book group, but I waited too long to start it because I was so engrossed in the Orphan Master's Son! There is no way I can finish it before Wednesday - it is over 400 pages of very dense prose - but I am giving it my best try. It's a strange story with a strange format, but I am enjoying it so far. I finished listening to an amazing middle-grade audio book, The One and Only Ivan by Katherine Applegate. Its Newberry Medal was well-deserved. I posted a review last week. And I started a new audio book, The Boy in the Striped Pajamas by John Boyne. I know, I am way behind on this one! I can see why it got such great reviews when it first came out. My husband, Ken, is still reading A Storm of Swords by George R.R. Martin, book 3 in his A Song of Ice and Fire series. At over 1200 pages, this novel definitely meets the criteria of a Big Book. It's almost time for my annual Big Book Summer Challenge! Look for details this weekend. Jamie, 18, is still reading The Lost Hero by Rick Riordan, though I suspect he had little reading time this week, in the midst of final exams. Not only did I not have time to post much on my blogs this week, but I just realized this weekend that I never even posted my Monday update to my Great Books for Kids and Teens blog - oops! 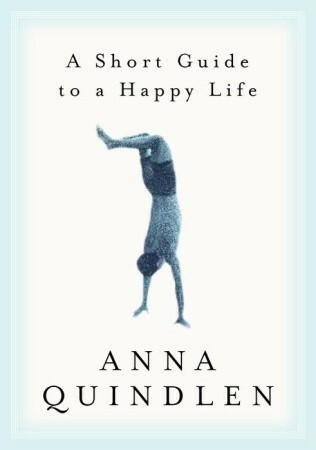 A Short Guide to a Happy Life and Being Perfect, two slim nonfiction books by Anna Quindlen, perfect for graduation season. The One and Only Ivan, an award-winning middle-grade novel by Katherine Applegate that I listened to on audio. Crazy, stressful week this week (with pockets of joy! ), so I didn't take any new photos. 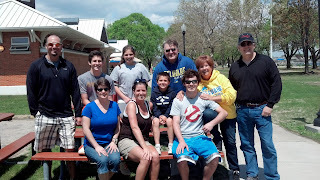 I thought I'd share a few from last weekend, when we spent Mother's Day in Connecticut with my mom and her husband and my sister and her family to celebrate both Mother's Day and my mom's birthday (an annual tradition). Don't worry - I won't bore you with family photos (well, maybe one). On Sunday, we went to the beach, along the Long Island Sound, and enjoyed the beautiful day, as well as a fun scavenger hunt! Norwalk Beach on Long Island Sound - lovely day! My family after our scavenger hunt! I recently read The Kitchen House by Kathleen Grissom for one of my book clubs. I started listening to it on audio and finished reading the paper book, and I thoroughly enjoyed both formats. This engaging novel presents a wide variety of characters in a part of history that I knew little about. Lavinia is a 6-year old girl who has just arrived in the United States in 1791, seriously ill and with no memory of who she is. Her parents brought her and her brother from Ireland, hoping to make a better life for all of them, but both her mother and father died during the journey. Captain James Pyke, who paid for their voyage and planned to employ her parents as indentured servants on his Virginia plantation, decides that Lavinia will have to pay off her parents’ debt (her brother, who is older and has more value, is sold). When they arrive on the plantation, the Captain sends Lavinia to the kitchen house, to work with the slaves. So, pale-faced, red-haired Lavinia is brought up by the extended family of slaves who work on the plantation. She grows close to them and comes to think of them as her real family. She works in the kitchen house and also in the “big house,” where she gets to know Miss Martha, the mistress of the house, and Sally and Marshall, the two children who live there. Lavinia is often reminded of her place as a servant, but when she hits her mid-teens, she is suddenly introduced to white society and expected to treat her family as her slaves. This is all very confusing to Lavinia, as she tries to figure out what her place is in the world. This novel is bursting with a wide variety of characters, both white and black, and a whole lot of tragedy, as Lavinia comes of age torn between two very different worlds. Before reading this book, I knew very little about the role of indentured servants in our history; their status was really no different than that of slaves, except that their servitude had a finite term. The narrative shifts between Lavinia’s perspective and that of Belle, the slave who runs the kitchen house and is the illegitimate daughter of the Captain. The audio book was very well done, with two different readers for the two narrators. Although everyone in my book group enjoyed the book and was glad to have read it, there were a few minor complaints. Some felt there were just too many bad things that happened in the story, but I thought that was fairly realistic, not only for the times but also for real life – some lives really are filled with tragedy. A few people thought the novel relied too much on stereotypes, which is probably true: most of the black slaves were good people at heart, and many of the white men were horrible and mistreated the slaves (though there were exceptions). All in all, I was captivated by the story and pulled right into its world. I found the historical backdrop fascinating, but I was also drawn into the fictional world of these characters and came to care about them (except the ones I hated!). It's Monday 5/13! What Are You Reading? It's Monday 5/6! What Are You Reading?